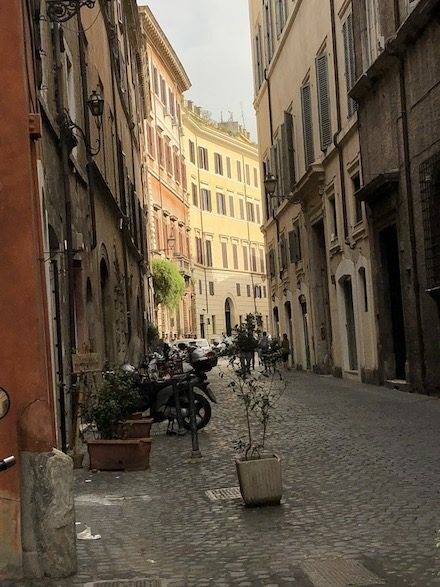 (April 20, 2018) – ROME FELT LIKE DISNEYLAND, or at least what I imagine what Disneyland must feel like, never having been. More precisely, perhaps, Rome felt like one of those places my parents took me to when I was a child: Frontier Town in upstate New York, or Colonial Williamsburg in Virginia, a place which is a representation of a place. At times Rome felt more like Rome, the Adventure Park, rather than a real city — a movie set of Rome, perhaps, where after the filming had wrapped, it was now open to visitors, dozens, hundreds, thousands of them, moving around crowded alleyways and sidewalks in packs, like swarms of insects having eaten all the detritus at one location and running off in search of their next meal. Rome was a near-impossible blend of ancient, classical, Renaissance, Baroque, and modern – although more 19th– and early-20thcentury modern than anything postwar, and almost nothing that we would label “contemporary,” certainly not when casually looking around, other than tiny cars and cell service and the utopian European currency instead of nationalist lira. The Rome I saw – and enjoyed immensely during my week there – utterly fulfilled a cliché, if there is one, of Rome qua Rome, of la dolce vita, of the beauty and the spectacle of walking amongst ruins of successive civilizations, ancient and pre-modern history, with an economy seemingly geared almost in its entirety toward foreign tourists and/or residents and locals playing their roles in that dolce vita, where almost everyone was friendly and outgoing and helpful and generous and ready and eager to serve without a hint of subservience or cringing nor arrogance or resentment. If anyone was cursing us behind our backs, as ignorant, ugly Americans or as buffoonish, spoiled tourists, they surely did a great job of hiding it. The riches of church art and history notwithstanding, the abundance of pre-modern architecture and pre-modern infrastructure – the narrow, winding, cobblestone alleyways opening upon small and large and colossal piazzas; the centuries-old stone footbridges across the Tiber – rubbing up against motor scooters and those mini-cars that can parallel park perpendicularly, the gelato shop on every street, the café and trattoria on at least every other, and the proliferation of school groups (mostly European) and crowds (at Trevi Fountain and Piazza d’Espagne and the Pantheon and on a few major shopping streets) just lent it all the more a sensation of “Rome World” rather than “Rome, Italy,” an adventure park where the adventure is being a visitor in this preposterous place of earthly and manmade beauty, the former center of the world, center of the universe, the seat of the greatest empire that ever ruled the world, now humbled by history but none the worse for it… Was this for real, or was this all programmed, like a Roman version of “WestWorld”? You’re tough on Rome – not to mention the Clark. It’s layered and you got to experience the first level (can’t expect much more in a short time visit). You’re also “right on” re the Disneyland effect but it’s true (as you know) of a sites now over touristed in many places around the world. Nothing anywere is like the view from the Janiculum. Glad you got there (spent some years nearby at the American Academy next to the Fonte Paola ……. you probably got there? …….. the big fountain down a bit from the top of the Janiculum …….. we lived just behind it for a few months in 2007). Michael: Great to hear from you. Apologies about my wisecrack about the beloved Clark. As you know, I’ve spent a huge part of my life at or in or near the Clark, and my comment was intended to be more about Gallerie Borghese, and to put it into a context that Berkshire folks might understand if they haven’t been to Rome. 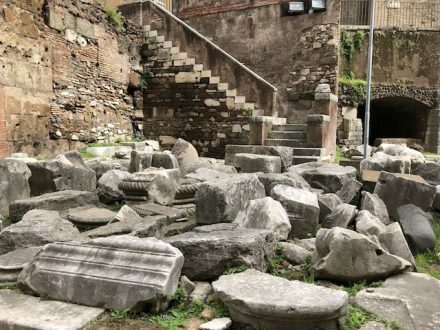 And as for Rome – was I tough on it? That was totally not my intention! I absolutely loved it and regret not just staying there. My Disneyland simile was meant to say more about my own experience of Rome (as dreamlike, unreal, surreal, all in a GOOD way) rather than about Rome itself. Thanks for taking the time to correspond.